You’ll see [Booster Gold] very soon, and there’s talks about…there’s actually a lot of plans for Booster Gold, one of my favorite characters. But yeah, Booster Gold fans, you will definitely be happy with what we’ve got coming up in the years ahead. Johns gave the update on Booster Gold’s future to Comicbook.com, but his comments are so vague that it’s hard to pinpoint where exactly he’ll show up. It was rumored last year that Booster would co-lead a movie with his best friend/Justice League International teammate Blue Beetle. Warner Bros hasn’t officially announced such a feature yet, but that could just be because it’s still early in development. On the other hand, there are signs that the small screen is Booster Gold’s intended destination. Last week, TV Line reported that a “beloved superhero from the DC canon” will appear in the Legends of Tomorrow Season 1 finale, and their “mysterious agenda” will pave the way for Season 2. Anyone who’s seen the series knows that its main hook is time travel, so what better series for a guy who originally lived centuries from now to show up in? Plus, in the comics, Rip Hunter has been a supporting character in Booster Gold’s adventure, and it was eventually revealed (spoilers from the comics are ahead) that Rip is actually Booster’s future son. This is something that could easily play out in Legends of Tomorrow, although the timeline would have to be adjusted for TV given that Booster hailed from the 25th century in the comics, but Arthur Darvill’s Rip was active in the 2160s. Assuming that this Legends of Tomorrow idea is correct, it wouldn't be the first attempt to bring Booster Gold back to live-action TV. Back in 2013, Greg Berlanti and Andrew Kreisberg worked on developing a Booster Gold pilot for Syfy, but nothing ever surfaced from that. Johns also hinted that Booster Gold could appear on The Flash around the time Season 1 debuted, but now that Legends of Tomorrow has become DC’s definitive “time travel” show, that seems like a more appropriate outlet for him. 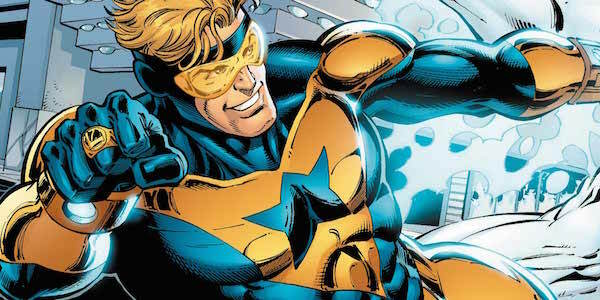 Whether it’s movies or TV, we’ll keep you updated on what’s in store for Booster Gold in live-action. In the meantime, if you’re looking to get your fix of DC Comics time travel, check out Legends of Tomorrow and the occasional episode of The Flash, both on The CW.